The following text is taken from the great book Airmen Behind the Medals by Graham Pitchfork, published by Pen & Sword. FOR an RAF airman to be awarded the Military Cross is a rare thing. Dr Courtney Willey, who post-war was to become a consultant physician at West Cumberland Hospital and live at Woodend, near Egremont, was such a man. During the war he frequently risked his own life to save others, in field hospitals and at a Japanese PoW camp. In 1940 he was a commissioned flying officer in the RAF, stationed at Tangmere airfield in Sussex. 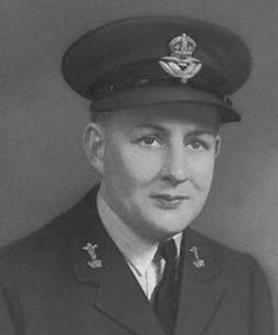 He was a ground medical officer with Squadron 601 when warning was received that enemy aircraft was approaching. It was a devastating attack which resulted in 13 deaths, 20 injured and a great deal of damage was inflicted. He organised the evacuation of patients from the sick-bay to an air-raid shelter. All were moved safely with the exception of one man who was violent. The sick-bay was bombed, the man’s clothing was blown off and he suffered burns, but survived. Dr Willey escaped unscathed when the corridor where he was also got bombed. Pilot Billy Fisk, the first American to join the RAF, landed in his burning plane and was attended to by Dr Willey and two orderlies. All were awarded the Military Cross but sadly Fisk did not survive. Dr Willey was posted to Singapore in 1941 and he shared a cabin with Dr John Simpson during a six-week voyage. They landed in October 1941 and in December Pearl Harbour was bombed. In 1945 Dr Willey was awarded the MBE for evacuating personnel from Sumatra. When Java fell to the Japanese 12,000 men were captured, of whom 5,000 at least were RAF. Willey worked in a former Dutch military hospital with the seriously sick and wounded, a place where dysentery was the main problem. Willey arrived at the PoW camp set up at Changi Jail but was later taken by train to Siam where the Burma-Thailand railway was being constructed through 250 miles of jungle. The sick were made to work on the line and Willey found it distressing to have to select the less weak to go and work, knowing that some would not survive. Willey was one of three RAF doctors at the base hospital at Chunkai where conditions were very bad and there were few medical supplies. There were 1,200 seriously sick patients evacuated from the jungle railway camps suffering from chronic tropical illnesses. Then the doctors were taken 200 miles away to a place where there had been an outbreak of cholera and worked for the anti-cholera and malaria unit of the Japanese army. When the unit moved to Burma, Willey was put to work on woodcutting, rice carrying and jobs in the cookhouse. Altogether he was three years in captivity. It was January 1946 before he was released from the RAF and able to return to his medical profession.